Licking her flowery and colourfull skin and smelling summer in the air with her pink flower bead nose. I made her last week specially for the Design Market, and now I have to make more because somebody bought her! I’m also entrying her in the contest at favourite site whipup.net, where Kathreen mentioned one of my posts as a fave (thank you!). The contest this week is themed colours! What could be better than a cat that gives you crazy summer feelings and makes you long for natures colours? Please add your comment and tell me what you think of her. Shall I make more? PS: This is a summer kitten but not a summer abandoned cat. Don’t ever leave your kitten behind when you return to town from your summer holiday, please! PS II: More cat craft to come soon, as promised (Oh, if you do hate cats, this is not a blog for you anymore I guess, I’m sorry, go bite yourself!). 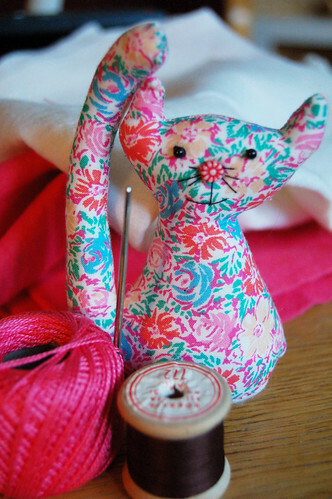 This entry was posted in Fabric & Sewing and tagged softies. Bookmark the permalink. aaaawww a very cute happy summery/springy cat..! I’ve been reading your blog for almost a month now. I’ve greatly admired all of your stuff, including this summer kitten! I’ve been SO shy to comment, and I was blown away when you found my blog and commented. I won’t be so shy in the future. I love your blog so much! And yes, you should do more kittens! I love her, she’s absolutely adorable! Damn! I want her!!!!! Who has purchased my cat!!!!? dropped by to say thanks for visiting my blog – I just love your kitty. She’s just so cheery! What a sweetie! Good luck! I think she’s so cheerful and happy. A lovely summer kitten. Yes! Make more! To swap with some of us maybe??? Well, I love it! Really cute nose it has btw, love the button idea! Just read a comment of claudia, to swap, well I’m in if you’re want to do that!! I think the nose is pure genius! Pingback: il Bloggo » il Bloggo Archive » Kitty-pat-cats for everyone!